Angelia! Congratulations! Please get me your address and I will get it out to you soon. I felt like I was getting back into the posting groove last week. Ha! Anyway, this is a little bit of what has been happening. Remember when I posted about Chuck making a box for me? I finally got it placed. Space is limited in my home and I was looking for a space to put seasonal decor. I love the idea of having a space to put out a little something special. Megan has been making stories. I love this stage! It says "God made apples and he made trees filled with apples." The other pages list apples, seeds, noodles, whole apples and apple pie. I think it is adorable the way she wrote some of the words such as apple piyye. Cute! I can't keep everything, but I put this one in the keepsake box. We spent a Friday evening out with friends. With the other two her permanent teeth were about half way through when the others came out. Finally with this one there is the cute little gap! I have been doing the Good Morning Girls bible study of Colossians. It has been good for me. It is getting me into the routine of quiet time and doing this with a group is very encouraging! Most mornings this is where you can find me about 7:45. Chuck and his dad finished up the fence this weekend. This gate leading to the back portion of our yard was all that was left to be able to say the yard was fully fenced. Now we just need to power wash and stain the rest. Not sure that is getting completed this year. We'll see. So that is a little bit of what has been going on around here. After a hot, dry summer this girl is ready for a change. Right on cue the fall weather has arrived! I am able to have the windows wide open and smell the wonderful fall scent as evening arrives. Heaven! To celebrate I thought I would host a little giveaway. While dining at Cracker Barrel (oh, what a cute little country store they have!) I picked up some fall flavored tea. Not just any tea, but scripture tea. Nothing like a dose of the Word while I enjoy my morning tea! I couldn't send you some tea without a cute mug to sip from. Did you see the Autumn blocks I made? I thought they turned out so cute that I made a set to give to one of you. Now to be entered I won't make you jump through hoops. All you have to do is leave me a comment. See... simple! I will draw a winner on Thursday, September 26th. Come on back Friday (or sooner!) and I will let you know who won. While reading my daily blogs I came across this post. I saw a picture of some blocks in a picture and knew I wanted to make something similar. Chuck cut me three 2x3 blocks and three 2x2 blocks out of scrap wood. I then painted them orange and added fall scrapbook paper using homemade hodge podge. It works great! I used scrapbook stickers for the lettering. Once that was done I rubbed on and immediately wiped off some stain. It is subtle but it really toned down the orange. Next I hot glued sticks on the shorter blocks for stems and then tied twine around the "stem." I am very happy with the way they turned out. I can't wait to find a spot for them this weekend. I wanted to do a little crafting during nap time today but I didn't have any modge podge. A quick google search and I was all set. and water. I filled the bottle with water to get equal amounts. Give it a good shake. I added a cute tag and was all set. A few weeks ago we went for a drive with my parents and ended up at an orchard. As many of you know apples in the mid west have not done well due to a freeze, a hail storm and the drought. The great thing about this orchard is that they have a cute country store that sells many local things. Meat, pies, vegetables and fruit. Since my grapevine didn't do well this year I picked up half a bushel of concord grapes. I didn't have time to make the jelly right away, but as you know grapes won't wait. I juiced the grapes and then stored it until I had time to make the jelly. You can store the juice in the refrigerator or can it. It just depends on how long until you are ready to make your jelly. I think jelly is one of the easier things to make. If you are new to home preserving this might be a good place to start. If you would like to see how I make my jelly you can see the post from last year. If you are wondering I got 30 1/2 jars. That should keep us going for a while! Another week is beginning and that means it is time to share another completed project from Pintrest on Pinned It, Made It Monday . I pinned this idea and decided to give it a try this weekend. All you need is a tube of plain ol'toothpaste (nothing fancy like gels) and some rags. This is Chuck's truck and it is weird that only the passenger side headlight had this build up of grime and yuck. The other side was perfectly clear. Anyway this is the before. I put a large around of the toothpaste on an old washcloth and then rubbed it over the light. It reminded me of waxing a car. I then used a clean towel and buffed the toothpaste off. While I was doing it Chuck came out and he was surprised how well this was working. He decided that we should do it a second time and the results were even better! I will note that as a precaution we did drive the truck through the car wash when we were done. Chuck had a concern about any toothpaste we missed on the paint and chrome. He wasn't sure it it would have a negative effect over time. He tends to be on the cautious side. We were both amazed by the transformation. I joined Megan's class on a field trip to the apple orchard. Do you see apples on these trees? This is first time I have been to this orchard and the views were beautiful. We were able to tour the kitchen. The ladies were making apple and blueberry pies. Sold by the slice or frozen to take home. That is a lot of pie dough to roll out! Did say that I enjoyed the scenery?! There was a small area with animals that was a hugh hit. Although I was disappointed in this trip as we were not able to pick apples (and for a few other reason I won't go into) I had a special moment with Megan that made it all worth it. I took her to the store to buy her a apple cider slush. We went out and sat on a bench so she could drink it and she said isn't this nice and quiet. She then went on to say that we don't get this very often. I hope stores that memory of a little bit of peace and quiet quiet shared together because I know I sure will! It reaffirmed to me again that it is the simple things that matter most. I left a comment on Carrie's blog today and then she e-mailed interested in how I limited my trips to the grocery store. I do a big shopping trip once a month. I did a previous post on shopping once a month. The thing that is most important in doing most of your shopping once a month is menu planning. I use to plan my meals once a week and found that I would be missing something or would get lazy and not make a plan. Both of these things cost me money. Beside shopping once a month I have been trying to do some bulk shopping to stretch the budget. The thing about this is that you have to have a little room in your budget as the initial purchase is a more. After the items are broken down the price is less per normal package. I also keep a well stocked pantry and freezer. I am a huge advocate of having a stockpile of food for hard times. We never know when there will be a job loss or natural disaster. Now that my menu is complete and my pantry and freezer are well stocked I am ready for the month. I don't use my menu in any order. The day or night before I will look at my menu and decide what to have. As I make a meal I will mark it off. I only plan dinner. Lunch is usually leftovers or I wing it. I will sometimes make a note at the bottom of the menu with some lunch ideas. I know that some things will need to be eaten first. Grapes and bananas are the first fruits eaten. I also make sure to prep my fruits and veggies soon after the shopping trip. I like to wash my lettuce and make salad stored in Mason jars. It seems to last longer this way. I also use my freezer to stretch things. I sometimes will freeze fresh veggies until I am ready to use them. I also make up meal bags. One month I made soup. 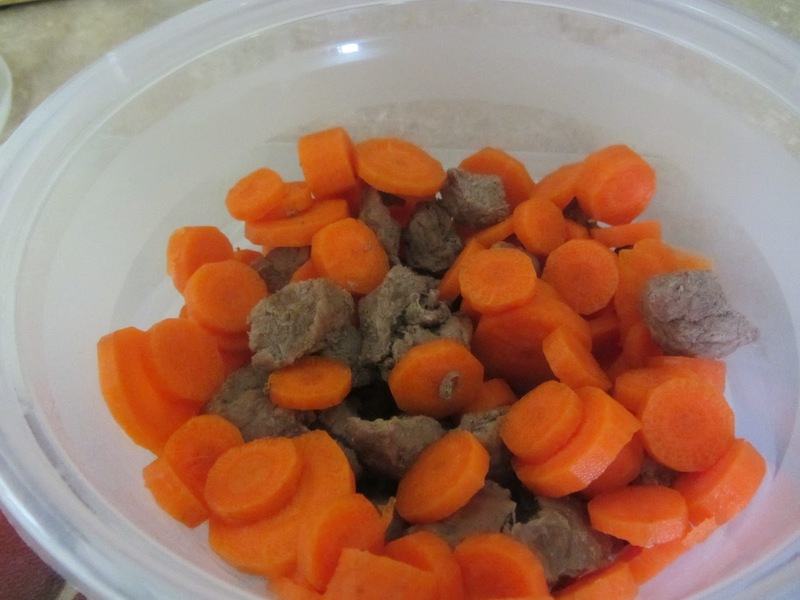 I cooked extra meat and then bagged it and some fresh cut carrots to use in a pot pie later in the month. I try to limit my trips to twice a month. Once for my big shopping trip and then again mid-month for milk and fresh fruit and veggies if needed. You'll notice I said try. Some months I am better at this then others. I do know that the months I plan well and stay out of the store the grocery budget is lower. This is what is currently working for me. As with anything it is constantly changing and being tweaked to meet the needs of my life.